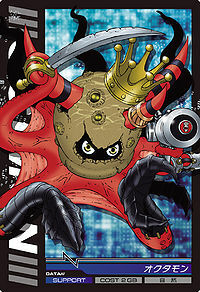 A Mollusk Digimon that was discovered from the virus used by a fiendish hacker to crash a rival's research computer. 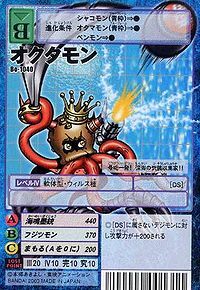 It has a nasty habit of collecting things; the tips of its tentacles are affixed with claws obtained from a Devidramon's data, and it is clad throughout with Digi-Treasure which it gathered from the bottom of the Net Ocean. 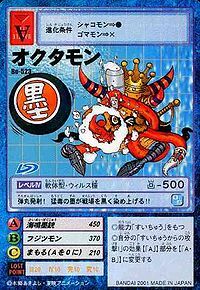 Fujitsumon, a kind of tiny Shellfish-type Digimon, cling to the pot it wears on its head. 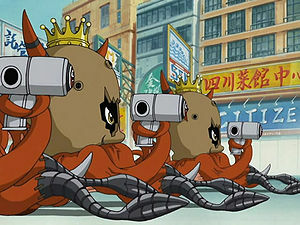 These Fujitsumon develop their senses, and it is thought that they have formed a symbiotic relationship so that if they sense danger they inform Octmon. Its Special Move is shooting a bullet packed with potently toxic ink (Kaimei Bokujū). Anime/Manga Digimon Adventure V-Tamer 01: "Burning Training"
Three Shakomon, who are the partner Digimon of three of the international Chosen Children, evolve to Octmon in ZT40. 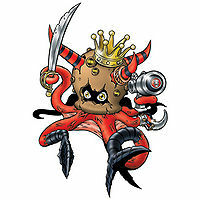 A Octmon was among the many Digimon seen through the rip in the sky during Vikaralamon's rampage. 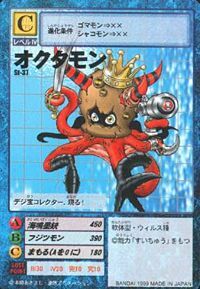 He is one of Neptunemon's minions in Island Zone. 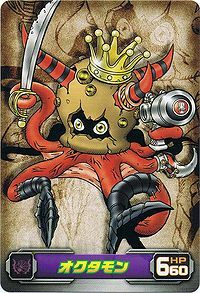 Octmon is an obtainable Digimon. Evolves from Shakomon (0-2 DP) or Otamamon (3+ DP) and can evolve to Dagomon (0+ DP). 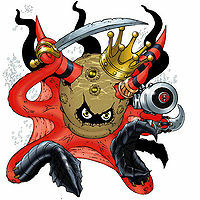 Octmon is an obtainable Virus Adult-Level Digimon and belongs to the Deep Savers Field. Evolves from Betamon at Level 21 with at least a minimum Defense stat of 95 and a minimum Aquatic Experience Stat of 550. Can degenerate back into Betamon at Level 7. 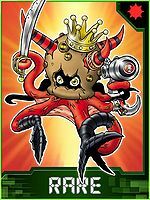 Octmon can Jogress Evolve with Gesomon to make a Dagomon if at least one of the Digimon has the Following stats: Level 33 with at least a minimum 200 Spirit stat and a minimum Dark Experience Stat of 3800. 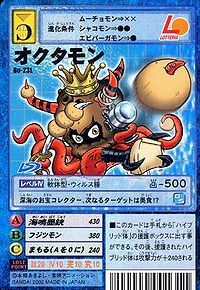 Octmon can Jogress Evolve with Kiwimon to make a Blossomon if at least one of the Digimon has the Following stats: Level 29 with at least a minimum Attack Stat of 170 and a minimum Insect/Plant Experience Stat of 5000. A NPC Octmon in the Southern Zenith Plaza requests the Player to look after the Water Goggles it lost at Thriller Ruins, but with the preerquisite of having an Octmon with the "Prissy" personality in the Digi-Farm and already cleared out the Limit Valley. Once the Player reaches to the Thriller Ruins and finds out the Water Goggles, the player has to find and defeat against a Bakemon, and return to the Southern Zenith Plaza to give Octmon back its Water Goggles. Octmon is available as a Digimon Medal. Evolves from Gomamon or Shakomon. Can evolve to Marin Devimon or be Jogressed with a compatible Digimon to get Anomalocarimon or Dagomon. Evolves from Gomamon or Shakomon. Can evolve to Marin Devimon or be Jogressed with a compatible Digimon to get Hangyomon or Dagomon. The Digimon treasure collector appears! Bullets fired! Its highly-toxic ink stains the battlefield black!! It fires a shot from its gun! 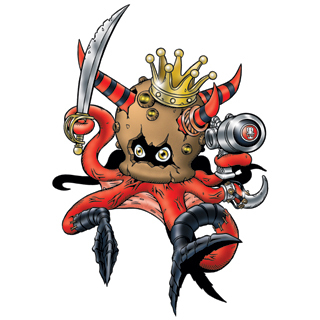 An armament collector from the deep sea!! This deep-sea treasure collector's next target is gourmet food!? This Digimon was discovered from a virus created by a malicious hacker. Its hoarding tendencies have led it to cover its body with the data and Digi-treasures it has collected, and it lives in a state of symbiosis with the parasitic Fujitsumon that have attached to its pot.